The Student Worksheet Packet is also found in back of the teacher's guide. 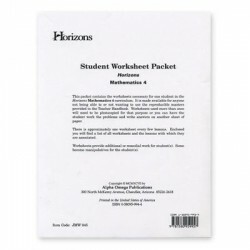 The Student Worksheet Packet contains 40 black-and-white, reproducible worksheets for Horizons 4th Grade Math. Worksheets provide additional or remedial work with approximately 10 to 90 problems per sheet. Individual worksheets cover concepts learned in the lessons. The Student Worksheet Packet comes unbound and includes a list that coordinates worksheets with lessons in Horizons 4th Grade Math.